I am glad to have had the reason to visit the Botanical Gardens in Dublin for the first time. 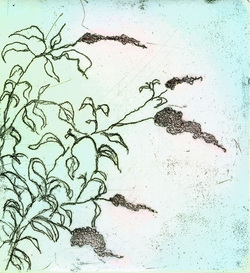 I was very impressed by the huge variety but in the end decided to make an etching of the Buddleia plant, common to many gardens and also growing in the wild. 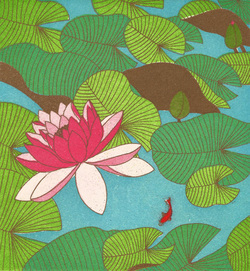 One day the sun was shining on a lilly pond. In that moment I could feel it was already becoming a memory. I felt a little melancholy . Not having visited the Botanical Gardens in Dublin previous to this commission I was very impressed with its space and, at the same time, slightly overwhelmed by the variety of trees and plants etc. 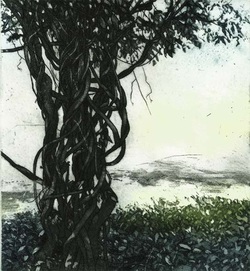 and the difficulty of finding something suitable to make an interesting image and so I was pleased to come across the Wisteria Senensis plant with its many separate branches interweaving around one another which interested me as an image for this etching. I find the ironwork of the glasshouses very attractive and I love the Egyptian style of the Palm House framework. Against this I put the majestic Fritillaria Imperialis plant which reminds me of the stylised plant designs in Egyptian and Turkish artwork. 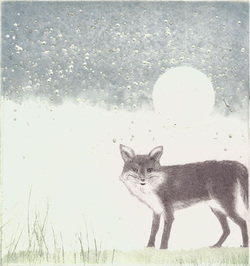 I chose to use linocut hand printed on Japanese paper using water based inks to add to the Eastern feel of my print. 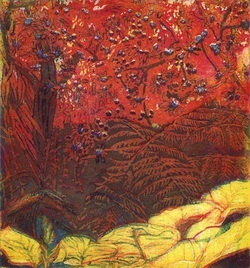 The arboreal environs of the national botanic gardens inspired this print. 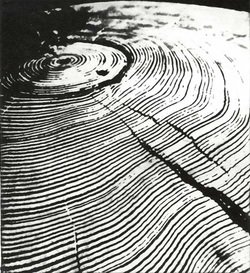 Tree rings are a natural record of the flow of time and our changing weather patterns. For this image I wished to map the cross section of a tree into a truly abstracted pattern making the transition from nature to culture. 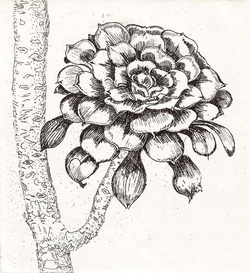 I am a frequent visitor to the National Botanic Gardens, drawing or just looking. 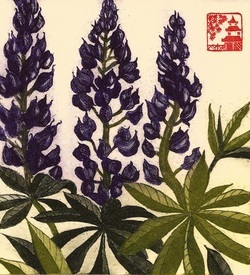 The Herbaceous Border is one of my favourite part, I love the way an apparently lifeless piece of ground suddenly bursts forth into the most amazing exuberant display, and then reverts to nothing at the end of the season.When I visited in July it was in full bloom and the Lupins were at their best. 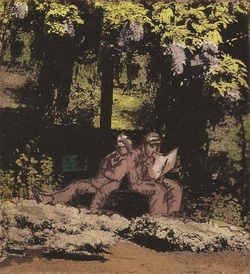 Gardens are often thought of as places of tranquillity and escape, whether in solitary or in company; a place to wander, or nestle and relax, lost in imagination, contemplation and thought. 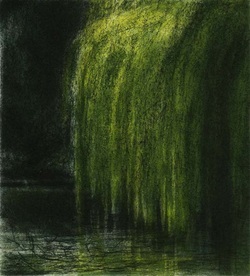 This etching features a Weeping Willow by the water’s edge in the Botanical Gardens. 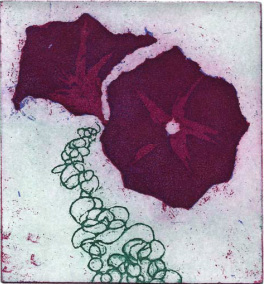 My print was inspired by my fascination with carnivorous plants and the Botanic Gardens have a fine collection. Bad news if you're a fly. The Herbaceous Borders were an immediate impact on me during 3 visits to the Botanical Gardens. 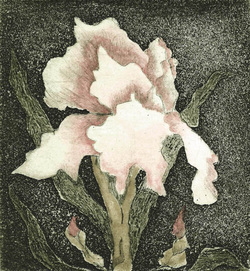 In was a difficult choice to decide what flower my print would depict, but in the end, the Irises took my fancy. 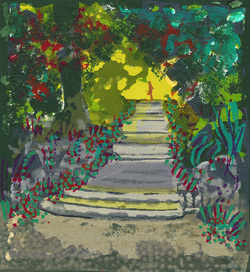 This image was inspired by seeing the 400-500 year old yew walkway at The Botanic Gardens, Kilmacurragh. 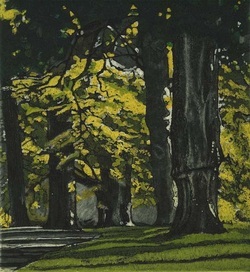 It is a beautiful, wide enclosed area where the double rows of ancient yews stretch their long looping branches across the wide expanse of pathway to meet overhead in forming an extended arch enclosing an interior secluded space. It is thought to have possibly been the location of an ancient Druid grove as these were their favoured trees. Such sacred spaces are said to have been the inspiration for their successors, - the cathedrals. I was lucky enough to visit the Botanic Gardens on a day that brought with it a low evening sun that saturated the gardens in a rich warm glow. Those areas where the sun’s rays could not penetrate the foliage which stood before it were, by contrast, steeped in heavy shadows. This dramatic light served to highlight the wealth of variety in the gardens, from the most ornate flower to the simplest of leaves. As such, I was inspired to try and capture one of the subtleties of the gardens, illuminated to me by this evening sun. Watching how light plays on landscape fascinates me. 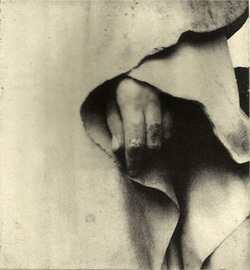 I observe the ever changing patterns and textures with light blurring the forms and shapes. I love to capture these moments and the serenity I felt while observing them. 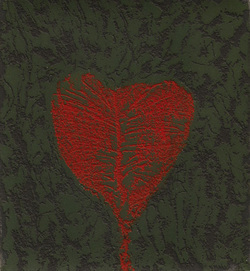 I like to use layers and textures revealing a work that can be mysterious and ambiguous. I was motivated by my experience of visiting the Botanical Gardens Palm House. The lush vegetation and exotic, tropical atmosphere in the steamy heat brought back memories of jungle treks in South East Asia. 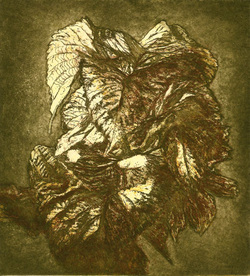 "Full many a flower is born to blush unseen and waste its sweetness on the desert air"
I was struck by this single rose petal in the rose garden, and while we are used to appreciating the rose as a complete flower, in this etching I am trying to emphasize its simple beauty. I was attracted to the bamboo because of the movement and energy of this plant. None of the upright stems grow straight but always at an angle. They seem to be perpetually in motion. 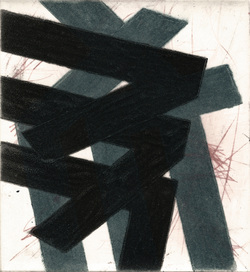 I made ink drawings which I later cut up and traced to assemble the composition. 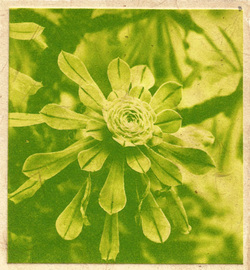 A separate block was carved to print each colour. But I felt something was missing. When I saw the full moon of the Autumn Equinox I knew immediately that this was the missing element. 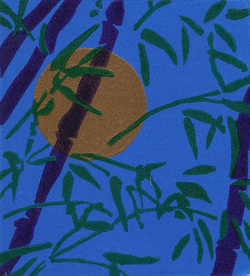 Also known as the Harvest Moon it is associated with gathering the crops and ideal for a print celebrating nature. The sensuous curves of the open flower, curious form of the bud, and gossamer threads of the seedhead have captured my vision and attention over time. A quiet, non-showy, but rampant member of the Clematis family, leaves, flowers, elongated stems have kept me drawing since meeting this plant in the Botanical Gardens some years back, and subsequently introducing it to my own garden. 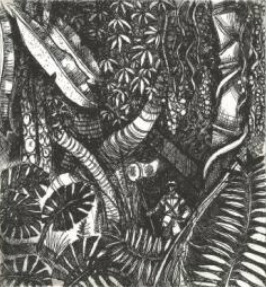 Drawing the essence of a plant, as opposed to the scientifically botanical is my modus operandum.To look into the quite ordinary, you can find the truly beautiful. The whole experience on visiting the National Botanic Gardens is one of love for nature and all it creates. In nature we find love in its most pure and beautiful form. My piece humbly tries to capture the essence of this. 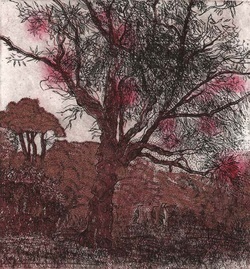 When I looked up the National Botanic Garden’s list of plants and trees, I spotted a favourite of mine Salix Babylonica or Weeping Willow as it is more commonly known. This is a beautiful tree which changes every time I look at it. It draws one in with its almost plaintive gait -fast growing, colourful, great for birds, wonderful! 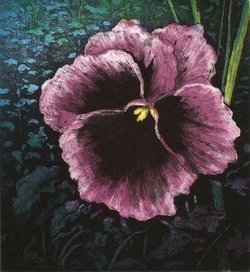 It is easy to be mesmerized by the beauty of nature and I have been many times inspired throughout my fine art career. However, on this occasion I was drawn to the wonderful complex and graphic design of this tree’s branches and how they twisted and turned at just the right place to create a natural flow of integrated connections. The bird, perched, quietly, ...observing the goings on above, and below. I took my grandson to the Botanics for the first time in early summer this year. He was totally enchanted with the 'Jungle' as he referred to the Palm House and half believed a Tiger might appear. 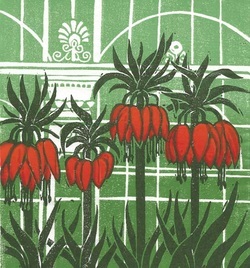 The exotic plants in the Palm House Collection were a stimulation to explore colour in the printmaking process. 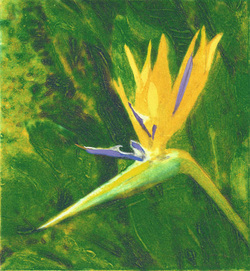 The ‘Bird of Paradise’ flower is a typical example, providing contrast of colour and shape with the lush green foliage background. I visit The Botanic Gardens regularly to draw. 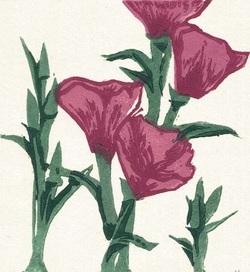 I visited in the late spring and made several drawings of the paeonies, which were in full bloom. The colours and lines within the flowers are endlessly fascinating to draw. I returned again in August and found a tree weighed down with apples. I decided to make a second plate and choose between the two. 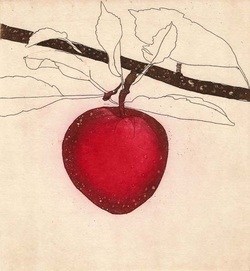 Again the colour and line and form of the apples weighing down the branches are a pure pleasure to draw. The beautiful structure of Richard Turner’s Curvilinear Range of glasshouses form a wonderful permanent backdrop to the ever-changing landscape of the Botanic Gardens. I took my inspiration from the National Botanic Gardens, in Kilmacurragh. Like most grand estates of the era the arboretum planting is designed to frame a view of the mountains beyond, and it was this that caught my attention. of the great Palm House. The view from below highlights both the characteristic leaf scars of this plant as well as the dramatic leaf shapes. 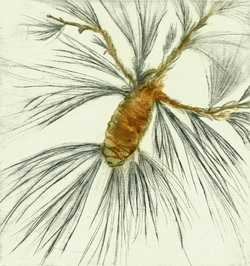 My Inspiration for 'Chromosome Dock' comes from my love and admiration for lofty Pine and other related conifer Trees which I have seen in some form or another nearly everywhere I've travelled. They survive and thrive in the harshest of habitats, from clinging effortlessly on to remote craggy cliff edges to neatly planted forests, surviving high and low temperatures. I was inspired by the arid plants in the botanic gardens. I was interested in the structure and the survival mechanisms of these plants. Having visited the National Botanic Gardens and being a tree-lover, I was struck by the lovely shape of the Cork Oak Tree specimen - Quercus Suber. 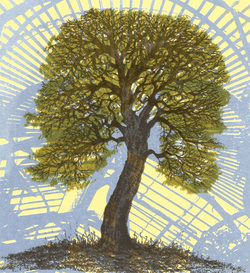 I decided that would be my main subject, and I included an element of the complex structure of one of the glass-houses, in order to put the tree into the context of the Gardens. 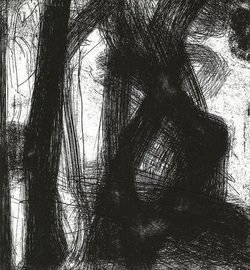 The glasshouse element of the print also mimics the shape of the tree. In drawing up the tree, I presented it in a stylised manner, rather in the shape of a Bonsai. I felt that this was appropriate, as the National Botanic Gardens do have an annual show of Bonsai trees in one of the smaller glass-houses. Lastly, as I was proofing the print, I remembered that the oak tree is part of the Flanagan crest - a sign !! The cacti in their glasshouse at the Botanic Gardens called out to me as I wandered through. Cobwebs hung from cactus to cactus, and they looked like they had stories to tell. 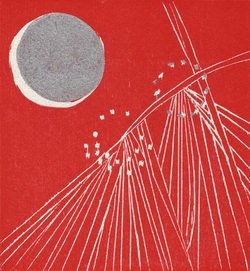 To me they spoke of the threads of connections that run between us. 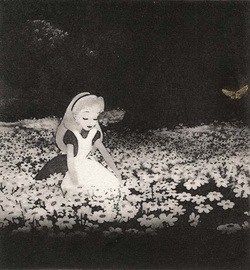 I thought of the stories we carry around with us as the cobwebs gather and the flowers bloom. 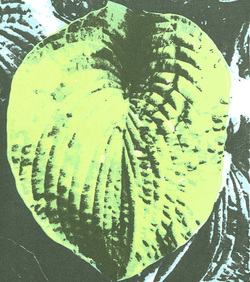 The print is based on my observation of how changing light in the Botanic Gardens created an infinite variety of greens, and revealed different aspects of the plants' texture, pattern and structure. The trees were majestic, all textures and shapes, and full of character – the stuff of fairytales! In 2005 I specifically visited the The Botanical Gardens on a trip to photograph Plant/Flowers as part of my research regarding my Degree show. I have been several times since and I have always been inspired by the Tulips. I find wonder in weather and the natural world. Mist, fog, rain, mountains, the sea and wild animals awaken within me a feeling of primal awe. Wild animals that are commonplace but at the same time magical are especially interesting. A frog, a hedgehog, a fox or a squirrel, we all know what they are but it's so exciting to spot one and be in their company. Walking around the stunning Botanic Gardens I thought of all this magic and wonder that surrounds us: An sionnach, vulpes vulpes, the fox. Foxes are everywhere in this city of ours but every time I see one I'm still excited by their secrecy and their ghostly beauty. I had a really enjoyable few hours walking round the National Botanic Gardens back in May when everything seemed to be flourishing, but I couldn't help thinking of all the tiny creatures that might be lurking under those leaves and flowers - both friend and foe. The phrase "you reap what you sow" originated in the bible , in the book of Galatians, the contemporary definition of which means to be responsible for your actions and the choices you make in life. 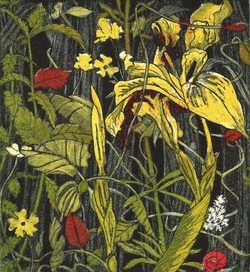 The title came after the image which was inspired by the native area in the Botanic gardens where every blade of grass, weed and wild flower has been allowed to flourish in a feral frenzy of natural growth. 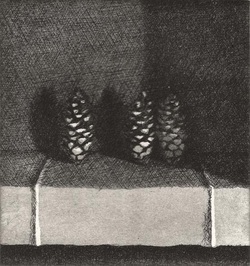 I picked up these three pine cones on a walk around the Botanic Gardens. Like many natural forms, pine cones have evolved so that their growth pattern conforms to the Golden ratio (1.618......) This apparently offers these forms a very efficient way to grow.The segments of the cones are arranged in two sets of spirals, numbering five and eight, going in opposite directions. These numbers (5 and 8) are part of the Fibonacci number sequences (0, 1, 1, 2,3, 5, 8, 13.........). As this sequence increases their ratio moves closer to that of the golden ratio.I have used the golden ratio and the Fibonacci sequence to arrange all the elements within the picture. 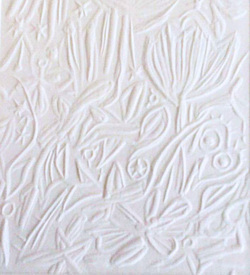 My work explores the space between the real and the imagined, the abstract and the concrete, and where our boundaries lie. 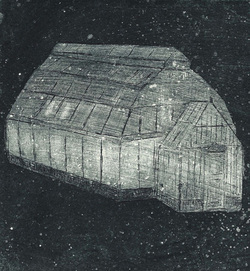 The print I made in response to the National Botanic Garden is based on one of the gazebos found there, beneath which stands a wooden bench. I was struck by the potential of physical structures to represent psychological spaces and the transient nature of that which seems so solid and real. The use of both natural and the man made built environment in the gardens are major sources of inspiration. 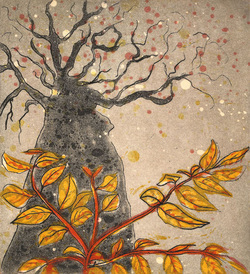 Jones's art works are fundamentally a metaphor for the imprint of time and mankind on the Botanical Gardens. 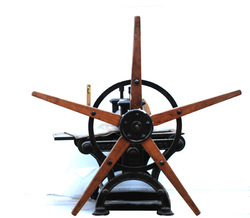 He is essentially a creative mapmaker, who uses a flat or an elevated perspective in making his work. For me, the most inspiring aspect of the Botanics was the unexpected bursts of colour of the blooms in the glasshouses. 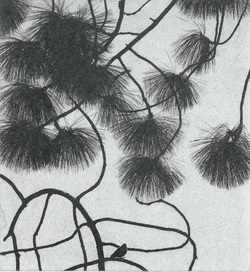 Allium Buds – having photographed them from various angles, I was inspired by the fact that each bud was stretching to the sky. 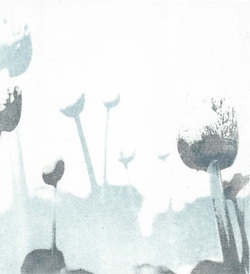 While there were many flowers at different stages, the Allium buds against the sky appeared almost life like. It was a cool bright morning early May and these buds where the beginning of summer, the beginning of something new for me. As a teenager I was an enthusiastic naturalists and roamed the fields of north County Cork with my butterfly net while dreaming of unattainable rainforests. When I discovered the Botanic Gardens at Glasnevin and the Great Palm House, I had found my own captive primeval rainforest and have never tired of its wonderfully moist and many-leafed interior. Here, exotic plants of every shape and form enfold the visitor in their green embrace. 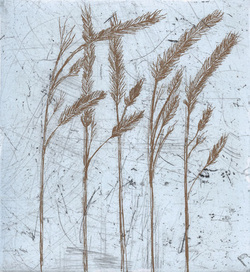 The title of my print comes from Book III of Homer's Illiad where the passing generations of human life are symbolised by the ever-renewing powers of nature. 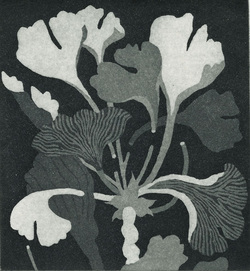 The inspiration arose from contemplating the process of photosynthesis, whereby a complex chemical interaction takes place between the sun and plant foliage; accordingly the print is entitled Leaf and Light. 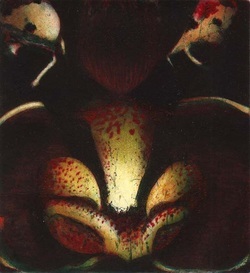 My image ‘Extranjero’ is based on an Orchid from Central America. 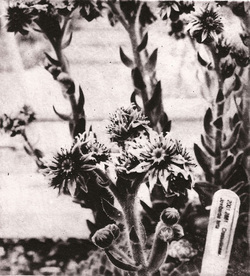 The title translates as Alien which this anthropomorphic plant (for some evolutionary purpose) very vividly imitates. The range and subtlety of colour, form, pattern and tone within the species has endless visual possibilities. There is something otherworldly about a waterlily suspended on dark and reflective water. On a sunny day at the Botanic Gardens I was struck by the form of flower and its reflections but also by the similarity between the shapes of open petals and wings in a space where plant and insect life are inter-reliant. Survival of the fittest: A weed native to Ireland. Naturalised worldwide being spread by humans both deliberately (ornamental flower with agricultural applications) and accidentally. A naturally adaptable species with the ability to reproduce quickly, disperse widely, live in a variety of habitats, establish a population in strange places, succeed in disturbed ecosystems and resist eradication once established. I live within walking distance of National Botanic Gardens in Glasnevin, so for me they are a treasured local amenity. My favorite aspect of the Gardens is the trees. I love the way they change with the seasons, the way, either bare or in leaf, they catch the light, creating beautiful vistas, casting dramatic shadows. The trees literally catch the light, and make their food from it. Trees sustain all life on earth, they provide food for the body and food for the soul. Keeping our native flora fresh in my mind from the Botanic Gardens, I was captured by the rich array of wild Irish flowers in Donegal this summer, among which were Bindweed, Nettles, Sticky-back, Buttercup and wild Iris, all vying with each other for sunlight. 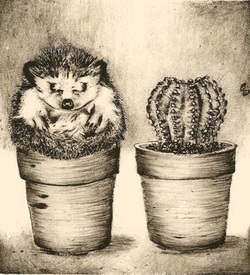 The Botanic Gardens have a wealth of flora being planted for each season.This in turn drew me to the pots, and the whimsical notion that the hedgehog has wondered into the cactus house and felt quite at home, and so planted himself there. 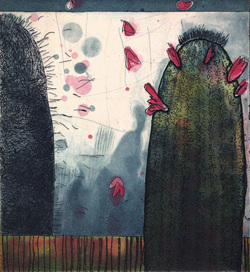 My print ‘A Visit to the Botanic Gardens’ is inspired by a visit and tour of the gardens in May 2013 organised for artists and printmakers signed up for ‘A Natural Selection’. 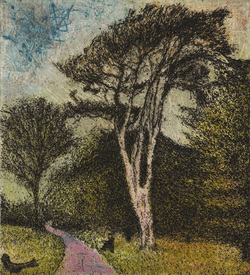 My print attempts to re-assemble some of my initial responses to the visit (and to re-orientate a jumbled sense of direction) as we zigzagged along a profusion of enchanting paths: through fields of bluebells, woodlands, a walled garden, stunning cast-iron and glass palm-houses; paths bordered with roses or that ran along river banks, over bridges; up and down steps...and passed through a wild variety of terrain: tropical forests, deserts, swamps, exotic islands, the Burren, cottage gardens.. .all in the space of a late spring morning. The final image has I think a removed but slightly mythic quality - a treasure map to coax the viewer to visit and revisit this ‘legendary’ place. The pine and its surroundings including the big bird, perhaps it is a peacock, that runs around there at the far end of the botanical gardens impressed me because it appears to be a well established habitat, the view of that particular tree was very striking. When I visited the Botanic Gardens on a beautiful June day I was struck my the exotic brilliance and scope of the collection housed there. 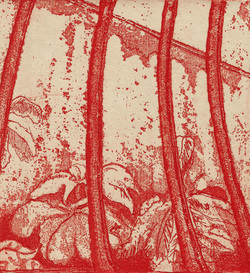 My print "Some Bushes" was inspired by trying to find the most understated of specimens. My idea was that, by creating a print of these shrubs I would elevate them to the level of any other plant with this memorializing document. I love the Palm House, from the inside and out, it's like a different world in there. As a Wicklow resident, I often take a trip up to the National Botanic Gardens Kilmacurragh where I enjoy monitoring the progress of the newly restored walled garden and getting lost in the arboretum only to emerge to the most stunning view. I love the juxtaposition of the tamed and the untamed. 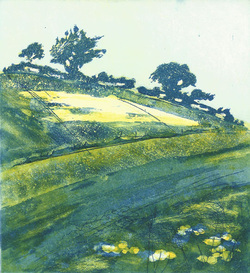 I have selected elements of the gardens - Lupins, Ferns and Irises setting off the sweeping vistas of the surrounding hills. 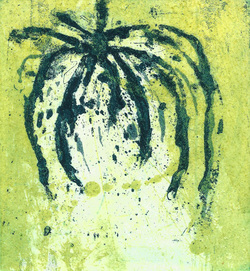 My print represents the symbiotic relationship between plant life and insects. They are so dependent on each other that it is difficult to make a distinction between the two. 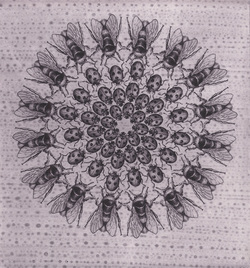 The flowers make up the insects and the insects make up the flowers. 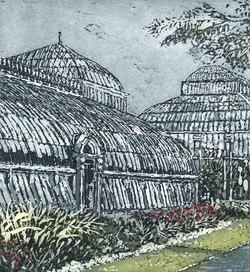 Reflected images on the surface of the glasshouses were my inspiration and I chose wood engraving to keep with the botanical theme. 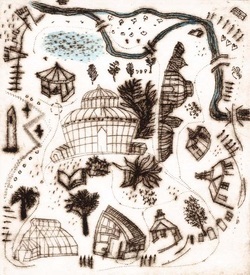 I loved the fragmented views of the flower beds, grassed areas, trees and sky in the glass and I wanted to superimpose the structured layout of the map of the gardens with the paths and pond. I chose to hand burnish this print rather than use a printing press so that I could have darker lines and subtler lighter areas, rather than a uniform black. The Botanic Gardens are a very special part of Dublin life and I can still remember the first time I went there with my mother. It is one of the few places from my childhood that doesn’t seem to have been touched by the passage of time. 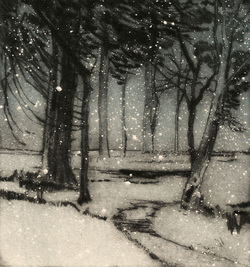 Snow falling lends a silence to a landscape, and when it cloaks the ground it obliterates a lot of the smaller details and textures.This is why I felt that a snow scene would work on a print this size. 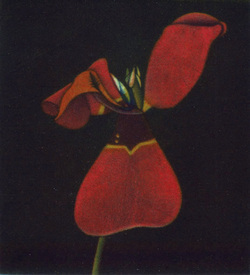 The tulip hails from Persia and first had its praises sung by Hafis(1327-9) the great Persian poet. “See these cheeky tulips how they raise their coloured cups and demand to sup”. 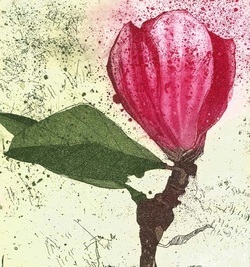 The tulip a flower of spring, it is seen as a symbol of life after death. 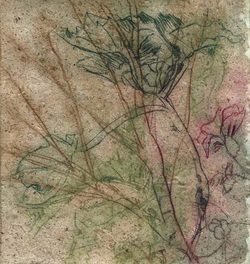 That is why I have chosen for my botanical garden print a tulip clinging on to life but facing death. “Spring was yet young and the tulip had raised it red cup when Ferhad died from love of Schirin, colouring the desert red with his heart’s tears. 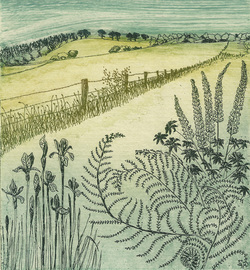 I have been working on the theme of pathways through natural environment, trees, undergrowth etc. The sunlight & shadow through this avenue of trees was a natural selection for me on this theme. 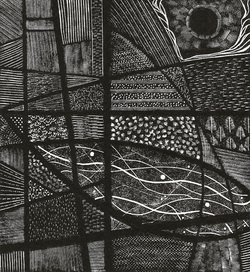 Working in a beautiful old studio surrounded by a variety of old and disused windows, obsolete vitrines and historic picture glass, I am particularly drawn to how the inherent distortions formed in glass during manufacture and the subsequent creep of ageing can influence how and what we see. 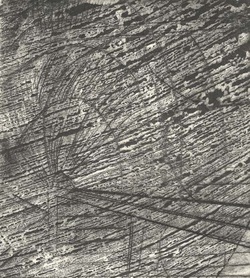 Such idiosyncratic textures together with additional visual patterns of rain, dust and oil provide a unique impression; a distorted reality. 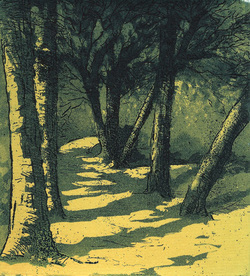 The image was inspired by the beautiful shifting shadows on the ground as you walk around the Botanic Gardens. I wanted to capture the shifting elusive shadow that can be here and gone in a minute, if the sun goes behind a cloud or the light fades. There is something very ephemeral about shadows, often glimpsed for a fleeting second before vanishing in our ever changing Irish weather. We often celebrate more long lasting things- a large tree, a beautiful scene etc but I think it’s good to enjoy the fleeting moment too. I visit the Botanic Gardens at different times of the year and observe the seasonal changes in a huge variety of plants. I chose a pansy for it's playful and mysterious nature. I love the naming and labelling of plants at the Botanic Gardens. This system of cataloguing has a symmetry, order and pattern. 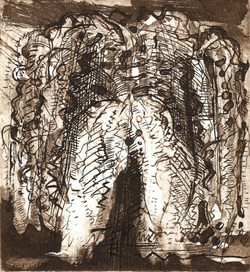 The print of the Jovibarba embodies it. 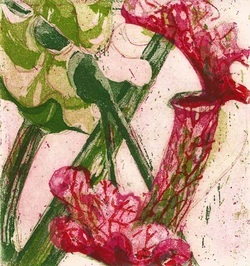 My visit to the native plant section of the gardens combined with my interest in local medicinal plants led to my choice of bogcotton (Ceannbhán) as the subject for my print. 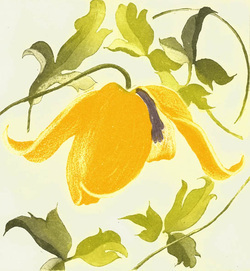 I have always been drawn to paint the Arum Lily. The pure white flower is simple yet stunningly beautiful with its tall dark stem and large leaf. Its name finds its origin from a Greek word for beauty and it is dedicated to the Goddess Hera, wife of Zeus. 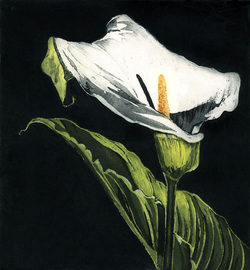 Hera’s milk formed the Milky Way and where drops fell to earth, fields of lilies sprung forth. 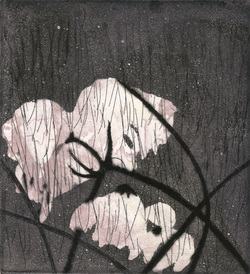 This etching is inspired by the wonderful bed of Arum Lilies I came across outside the Great Palm House on one of my visits to the Botanic Gardens this summer. I once had the privilege of living on Washerwoman’s Hill just a stone’s throw of the Bots, as they were colloquially known in Glasnevin. It was my refuge as a young man with buggy and there I often met, amongst other regular Bots refugees, my elderly neighbour who also took daily time out near the Palm House. I particularly enjoyed the garden’s secret environments mid-week and off season when the day trippers were scarce. A small plant just outside the gates, maybe in the parking space? No name and tiny. A happy unexpected meeting. A silent joy to slowly come closer and after a while start trying to make a portrait – of an unknown plant. 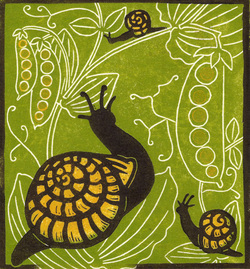 "The wild native garden -was an oasis of visual contentment in the urban melee". 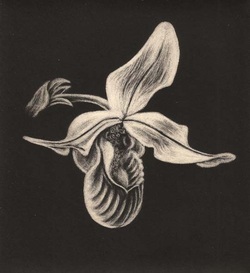 After my visit to the botanic gardens it was the beauty , rarity and fragility of the orchids that inspired my print of the phargmipedium or slipper orchid. 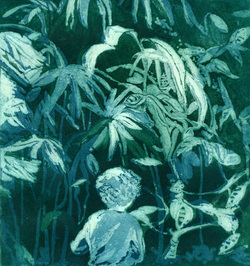 The inspiration for my print was the rose garden in the Botanic Gardens, where I spent time sketching in June this year. 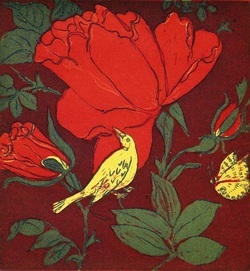 I imagined a connection between the garden and allegorical references to the rose in poetry and decorative art. 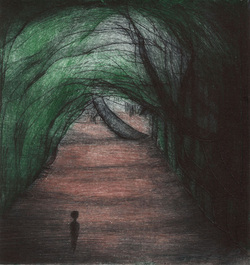 The Rose Garden is both a real and an imaginary enchanting place. 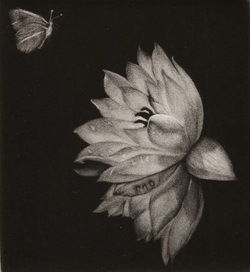 A trip to the National Botanic Gardens during the summer of 2013 inspired this work. The gardens were full of indigenous cabbage white butterflies that contrasted wonderfully with the exotic eucalyptus tree. A bulbous wart-covered section of the tree proved the perfect background for the simple beauty of the butterfly. I am a regular visitor to the National Botanic Gardens and never fail to be inspired and delighted by it’s wonderfully diverse collection. On this occasion I was drawn to the colour and fragrance of the rose garden, and particularly to a small, scarlet, single, cluster-flowered rose, “rose eyepaint”. The simplicity, vibrancy and joie de vivre of this little rose seemed to me to epitomize and celebrate the glorious summer that was 2013! 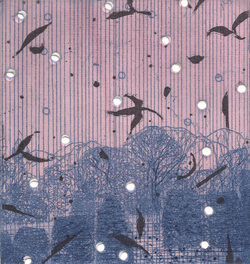 This piece attempts to recreate the feeling of tranquility and harmony that can be experienced from a visit to the Gardens, along with the artificially structured wildness that is naturally found everywhere here. 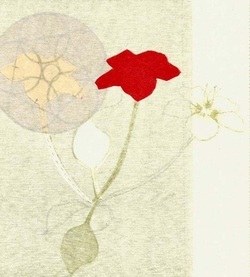 The title relates to my own feeling of freshness and renewal after a visit to the Gardens. Walking through the gardens in the sunshine I began to imagine tourists and visitors as exotic creatures and wild animals enjoying the serene landscapes before returning home to share tall tales of twisted trees and beds of phacelia. From the minute and intricate to the gnarled and epic the Botanic gardens hold an unending tale of fascination and storyboards for dreaming. I used to go to the Botanic Gardens with my parents and sister as a child. Due to my allergies with some of the plants we used to sit in the meadow at the back, chase the red squirrels, and my sister would make daisy chains. My eldest daughter is called Alice and is obsessed with Alice in Wonderland, I thought it quite fitting. 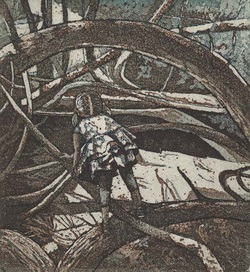 'Wrenn's Nest' is based on a quick photo snapped as my niece (the Wrenn in question) climbed through the branches of the Cryptomeria Japonica Elegans in Kilmacurragh Botanic Gardens, Co Wicklow. A fantastic natural playground that attracted every child from the nearby picnic tables and provided them each with their own secret garden to explore. 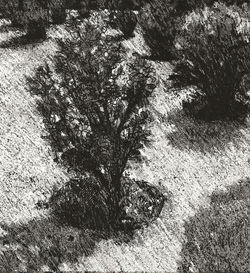 The image is drawn from memory; a day in early summer, a day of deep shade and strong sunlight in the gardens of Kilmacurragh; the once wild and overgrown grounds of a now faded home. What struck me on my visits to the National Botanic Gardens, was the relationship between the visitors and the gardens. There was no formality and people felt completely relaxed. Students studying, mums and babies having picnics even one man I found asleep in the sunshine. I found the couple resting under the Wisteria Tent and was touched by this obvious love of the place. ‘Taxus baccata’, better known as Yew is a poisonous tree, except for the red aril surrounding the seed. When our daughter was two year old she ate one of the yew tree berries at the National Botanic Gardens and we spent the following night at the hospital where she was monitored for cyanide poisoning. 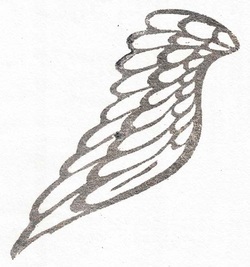 The silver wing celebrates the angel that protected her that night. 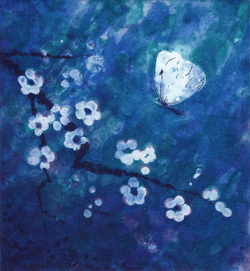 I remember as a child searching The Botanic Gardens for a crab apple tree like the one in our garden at home, a memory that is mixed with others of blue summer skies and butterflies. 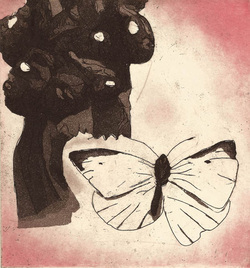 These themes have also melded together in my print. 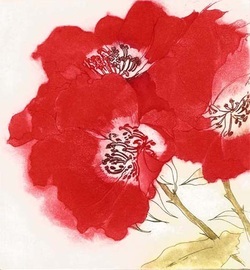 Many flowers have been associated with certain feelings and ideas for thousands of years and this flower is no different. 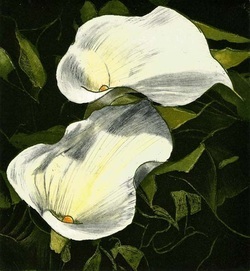 However I was not drawn to the Calla Lily because of some symbolic meaning. 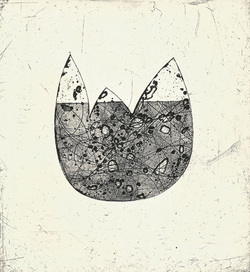 I was drawn to it purely for its simplicity and grace. Pure white flowers contrasting sharply with bottle green arrow shaped leaves crowding beneath. It is easy to understand why its name means magnificent beauty. 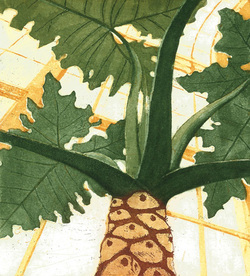 I was inspired by the structure and symmetry and architecture of the palm house and its contrast to the organic form. I visited the Botanic Gardens in August on a very wet Sunday. The light through the trees after the rain was wonderful and the glasshouses provided shelter and calm. In 1790 the Irish Parliament granted funding for a public botanic garden. From that date to 1890, Walter Wade, John Turner, Ninian Niven, Richard Turner, David Moore, Sir Frederick Moore and William McNab, were all involved in some way with the conception and development of the National Botanic Gardens in Dublin. 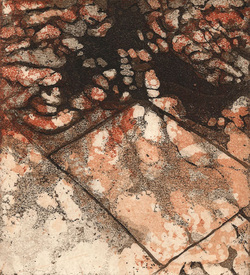 The print (Title: 'The germ of an idea') represents the conception and germination of the concept for the gardens in the minds of those who founded, designed and nurtured the Gardens. 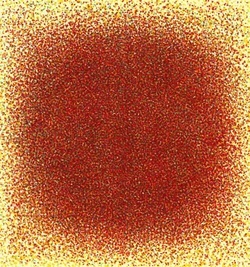 At the same time, it plays with the image of seeds, germination, and embryonic beginnings. 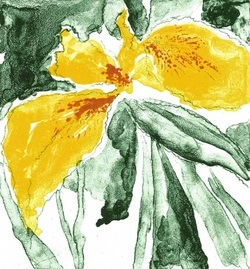 My print is inspired by the Botanic collection at the Botanic Gardens. 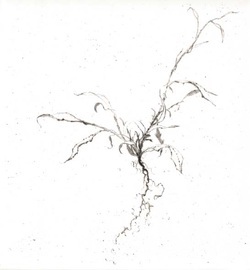 I have chosen a native plant and portrayed it on paper made with fibre obtained from dead plant material harvested from that plant. Kilmacurragh, now owned by the Botanic Gardens, is an old garden in Co Wicklow. It surrounds the burnt- out remains of an early 18th century house. It is full of exotic plants from around the world collected by the former owners, the Acton family, throughout the centuries. undergrowth forming an interesting contrast to the many different plants and trees surrounding them including the blood red fiery colours of the prolific Rhododendrons. 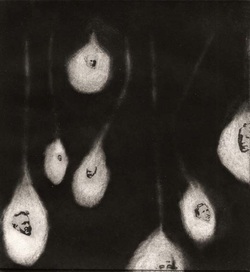 This is what appealed to me and is what I have portrayed in my etching. 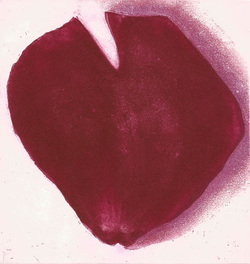 The Bleeding Heart is the first plant I ever really saw. I have a childhood memory of taking my blind grandmother for a walk in her back garden. 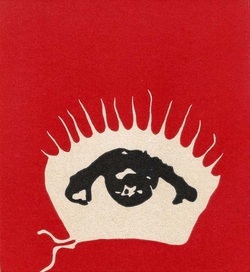 Grandma was blind, but she knew where everything was. She wanted me to lead her to a certain plant. All plants looked the same to me back then. 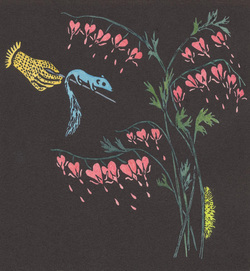 When we got to the right spot she said, “These are bleeding hearts.” Her way of seeing was to touch and sense things in a way that seemed both magical and ordinary. She taught me to see with more than my eyes and to always love bleeding hearts. I have always loved gardens, they are peaceful, beautiful places. I am also a keen gardener, and have a City and Guilds certificate in horticulture. For my image, I looked in the herbaceous border, with it's huge variety of flowering plants. 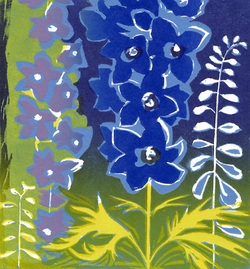 I chose a Delphinium for it's wonderful blue colour. My current body of work marries my fascination with old maps with my love of the architectural detail of Dublin, more specifically Dublin's North-side. It was therefore a pleasant surprise to find a project right at the heart of my current work. In this piece I used a detail of the statue of Socrates and have set it into Mutlow’s map of the Glasnevin Botanic Gardens from 1818. 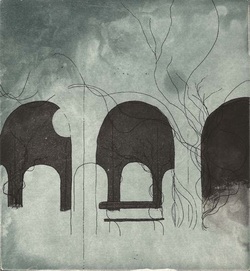 The map is not visible in this Photograph, but surrounds the image in a subtle but very deep embossing in white and grey. 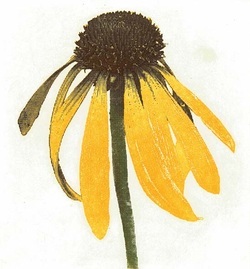 The print is inspired by particles/pollen/dust released by flower heads.